The building of the mishkan, the holy Tabernacle, is described in great detail in this portion, and women are notably acknowledged as contributing through their craft-making to its construction. I seek to capture the essence of word and image as they guide into one’s soul. 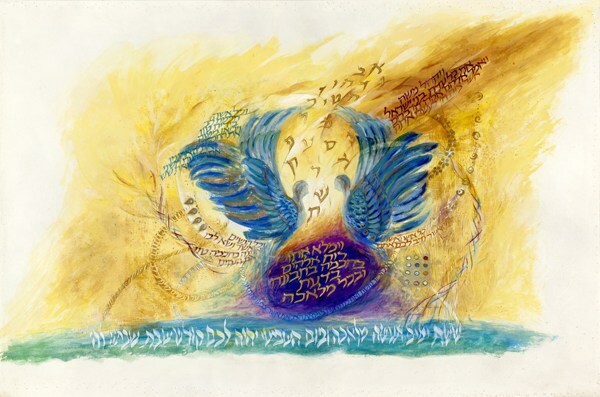 Drawing from a traditional midrashic teaching in which we learn that Bezalel engaged the letters of the Hebrew alphabet to create the mishkan, this piece depicts the alef-bet, the Hebrew alphabet, flying between the keruvim, the two-winged creatures placed facing one another on the cover of the Ark in the Tabernacle. Professional Background Sharon Binder was born in New York, where she earned a BA degree in Art from Queens College. She studied calligraphy and design with Alf Ebsen, Nona Brown, Donald Jackson, Sheila Waters, and Thomas Ingmire. Her work combines tradition with new artistic forms. Binder’s work has been commissioned and collected extensively in the United States, Canada, and Israel.